16' Aluminum Plank Details - Quasius Equipment, Inc.
Our 16' Aluminum Plank is 12" wide. This is a Werner model 2316 plank which is carries a 500 lb. two man rating. 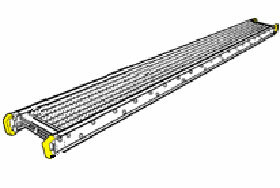 They can be used with ladder jacks or to span between two towers of scaffolding. The raised and perforated non skid surface ensures that you won't be sliding around if they get wet. In addition, we also have a 24' Aluminum Plank for those who need more length.